I have been quilting and binding quilts like a mad woman over the last two weeks. I have been working on donation quilts for the West, Texas. In all the flurry, I decided to throw one of my quilts on the frame and finish it. This is “Hip to be Square”. I had the quilt top finished last summer but then it just sat and I didn’t get it finished. I ended putting it on my UFO list that I made at the beginning of the year. This makes my 6th UFO finish of the year-ha-who!!! There are still PLENTY more quilts on the list to keep me busy. I have a free pattern available for this quilt that you can find that here. 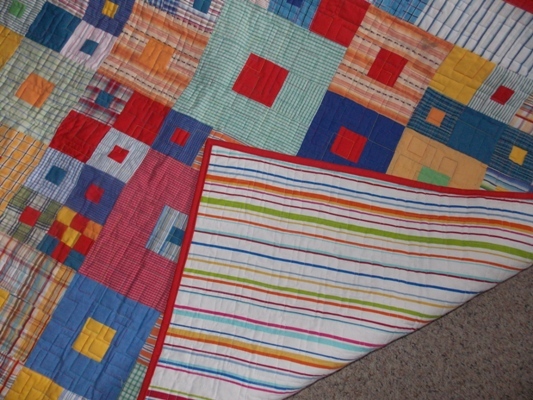 One of my blog readers also made it and sent me a picture of her quilt that you can see here. I used a sheet for the backing. I thought the stripes would be fun with the plaids. I used a square quilting pattern on this. Variegated thread was used on the top and and white thread on the back. I can’t say how much I love variegated thread..or how much I love doing the squares quilting design. This quilt was 100% recycled. The top was shirts..the back a sheet and the batting left over pieces sewn together from other quilts. It makes me feel like it was almost free. Today, I am hooking up with……Confessions of a Fabric Addict, Link a Finish Friday, Freedom Fridays and Crazy Mom Quilts. 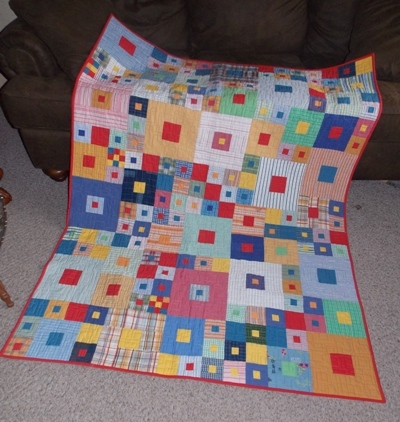 This entry was posted in Finished Projects, Quilting on May 10, 2013 by Jo. A masterpiece made from recycled fabrics…love it! Great job! Jo, love your quilt and the backing is fantastic with it. Thanks for sharing the pattern. Good for you making goals to finish your UFO’s and then doing it! I love the striped backing. Great job, Jo! Bright and beautiful! I love it! Oh my!! This quilt is beautiful! My favorite quilt patterns are ones that use simple squares arranged in an interesting way. Just lovely! What a beautiful quilt! Love that it is all upcycled! Really cool Jo, I love it! Its fantastic! What a great upcycling job! Yay! I really really like this quilt Jo. Cheerful colors, lots of sizes of squares, it’s all so great! Nearly free except for your time, which you are lovingly giving to the Texas cause. Thank you. It is wonderful! Well done! Love this pattern!!! That is a very cool quilt, Jo! And how wonderful that it was “free”!! Whoop whoop!! Really like that quilting pattern with those plaids and stripes – it’s just the thing! 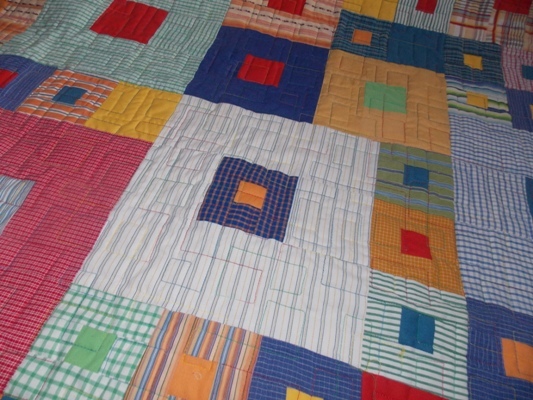 I use soft recycled sheets with my charity quilts a lot – no piecing the backs of quilts! I have found flannel Star Wars sheets and Lion King sheets that have been perfect for little kids quilts. I love your quilt. Thanks for sharing and the link. I can’t wait to make one too. Whoop! Whoop! Thank you for such a lovely quilt pattern,which I want to make for my next project. I can’t see how much fabric is needed, would you be able to post the ‘ingredients’? Just stumbled across your page and have meandered through it for the last 45 minutes. Love it! So sort 6 familyish. I only have Internet with my phone, no computer access. BOO. Enjoying your site.